Related News Item: New York Sea Grant Responds to Superstorm Sandy (Mar '13) Related News Item: NOAA Progs, FEMA Educate For National Severe Weather Preparedness Week (Mar '13) NYSG's "Hurricane Education" Resources More on "Hazard Resilience in Coastal Communities"
Stony Brook, NY, March 7, 2013 - Hurricane Sandy’s storm surge and high winds inflicted tremendous damage along New York’s coastlines during the late October storm. This included the destruction of infrastructure along Long Island’s populous south shore as well as the creation of breaches in the barrier islands which protect Long Island communities. In response, New York Sea Grant (NYSG) has funded two new research projects valued at $50,000. Says New York Sea Grant director, Dr. Jim Ammerman, “NYSG will support a research team led by CUNY to examine the impacts of the huge nitrogen loads released by the crippled Bay Park Sewage Treatment Plant in East Rockaway on the water quality of the Western Long Island South Shore estuary.” The other project will determine how the breach on Fire Island will impact Great South Bay and surrounding communities. These New York Sea Grant rapid response projects were mentioned in Ammerman’s recent testimony at committee hearings of the New York State Assembly and Senate. 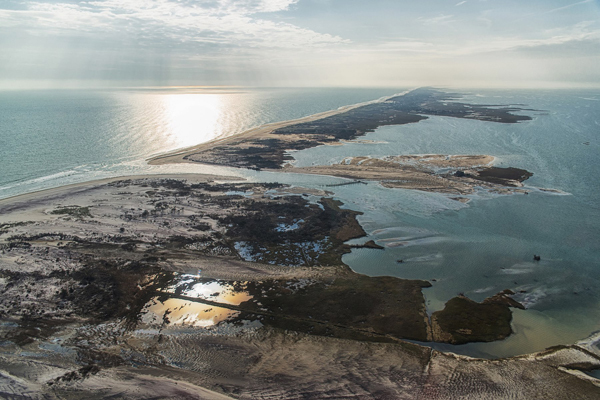 Sandy’s wrath caused three breaches across eastern Fire Island, but the one with greatest potential impact is at Old Inlet, a narrow part of the island with a long history of breaches that fronts a portion of the mainland containing 13,000 homes collectively valued at $10 billion. How this breach will evolve and what impact it will have on Great South Bay communities are important questions facing coastal managers and nearby residents. With Sea Grant funding, researchers Charlie Flagg and Roger Flood from the School of Marine and Atmospheric Sciences at Stony Brook University are gathering data to characterize the breach as it develops; its evolution will affect the tidal dynamics and the ecosystem of the eastern Great South Bay. Using sensors to measure sea level, temperature and salinity at Old Inlet and at nearby marinas and buoys in Great South Bay, the research team is constantly monitoring the breach. Says Flagg, “With real-time measurements of water levels, we will be able to alert managers if and when the breach undergoes a shift.” Reports following several November and December nor’easters indicate that the breach is remaining largely stable. A separate grant has been awarded to Chester Zarnoch from the City University of New York’s Baruch College, Tim Hoellein from Loyola University Chicago, and Denise Bruesewitz from Colby College, a research team that has been collaborating on nitrogen studies in the Hudson River Estuary since 2010. 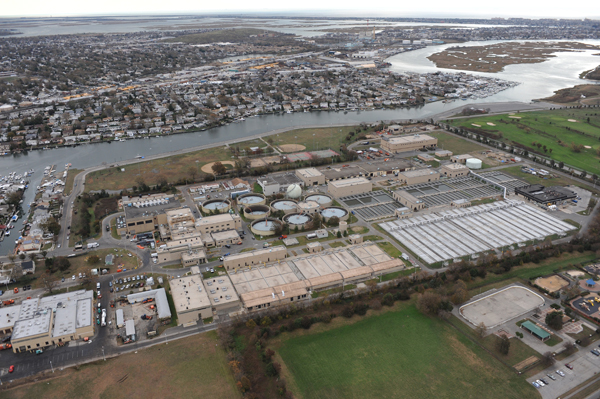 They will be looking at the Western Long Island South Shore estuary where storm surge from Hurricane Sandy caused significant damage to the Bay Park Sewage Treatment Plant in East Rockaway, NY, a facility that treats 50-85 million gallons of Nassau County’s waste water each day. 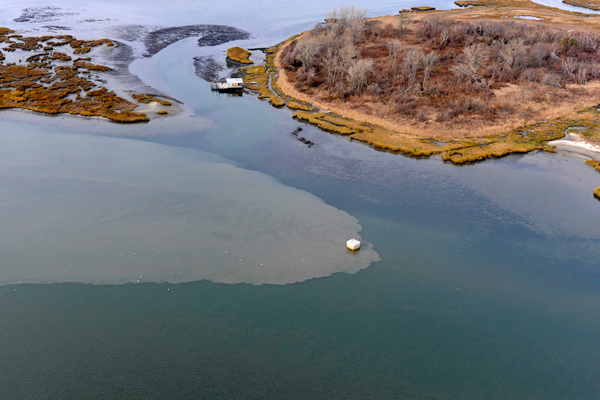 Immediately after the storm, an estimated 68 million gallons of raw sewage was released into the Western Long Island South Shore estuary. As repairs were underway in the ensuing weeks, partially treated sewage continued to be released bringing the total to more than a billion gallons. The team will measure if the ecosystem will increase its capacity to remove nitrogen or if the enhanced nitrogen loads will shift the ecosystem to an alternative state that perpetuates additional organic matter loading. Researchers will study nitrogen transformations in different habitat types and expect rates of sediment nitrogen and oxygen dynamics to change across seasons. These two new projects add to New York Sea Grant’s suite of research and outreach projects that address the state’s coastal hazards. NYSG has been funding the Stony Brook University Storm Surge Research Group over the last decade helping them to create a composite storm surge model that tracks and predicts storm surge in the metro New York area with greater accuracy than other models. NYSG also funded their original modeling research that suggested that storm surge barriers or flood gates could be feasible, a concept that has begun gaining support. In the NYS 2100 report commissioned by Governor Cuomo, one of the recommendations for developing a resilience strategy for New York Harbor suggests that managers “conduct a comprehensive storm surge barrier assessment for New York Harbor.” Stony Brook Storm Surge Research Group members lent their expertise during and right after Sandy made landfall, sometimes correcting misinformation about storm surge levels reported in the media. New York Sea Grant’s extension specialists are currently working closely with stakeholder groups trying to assess the economic impacts of Sandy to coastal businesses. NYSG’s coastal processes specialist Jay Tanski who provided the National Park Service’s Breach Assessment Team with research-based information on impacts of new breaches, is also working closely with marinas to characterize their economic losses. Through confidential surveys, he has asked marina owners to describe their initial investment on the buildings, facilities, structures, inventory and equipment in their marinas before and after Sandy as well as estimate the lost revenues and marketing opportunities. Antoinette Clemetson, NYSG’s marine fisheries specialist, is working on the effect of Sandy on several other segments of the coastal business sector—recreational fishers, bait and tackle businesses, charterboat and party boat captains—since the declaration of a fisheries disaster by the U.S. Secretary of Commerce. As the region struggles to assess the impacts on livelihoods, NYSG and partners developed a confidential questionnaire asking business owners to describe the changes in their business that occurred since Sandy. The resultant data will help create the foundation for a spending plan that is required in an appropriation request to rebuild the fishing industry.